The group does not recommend withholding “support” from your children as part of the Non-Violent Action. What seemed to be an impossible situation starting in 1998 was resolved in early October, 2011 — see details below! $125,000 dollars behind (July 2011) – what about that!? — Well, it’s easier than you think. Just imagine an initial support level based on twice your income. Imagine your five year old child then being relocated to the other coast and being given ‘visitation.’ Now, add a former spouse that blocks phone contact. Between airline tickets, accommodations, rental car & expenses — each ‘visit’ is almost $1000. I’ve actually spent about $60,000 in support of my child on much less actual income — but it doesn’t count at all? For complete details and legal documents see below. I only know one thing of ’empirical’ evidence to support my decision. My son is 16 now, living on the other side of the Country with a former spouse who sought to alienate us. This summer we had a great time together on vacation. He (and I) are tired of ‘counting days’. How many more days of vacation? How many days till the next visit? How many days till…. I noticed on his laptop he has a countdown timer — it was set to show the days:hours:minutes:seconds till our summer vacation. His love keeps me motivated. I can’t forget all the needless pain I have seen him go through because of the ‘system.’ Many of you have kids who don’t even want to see you — I don’t know how you stand it? I would never trade places with you. In the last 7 years I have flown out there 4 times a year for visits, and 2 times a year to pick him up for vacations here. How many of those could I have traded away — and not lost our relationship? I did not want to find out. You? Aug-Oct 2011 – With the assistance of her new husband, my former spouse and I were finally able to resolve over $125,000 with a cash $10,000 payment, all support orders terminated. I still can’t believe it happened, after 15 years of struggle, finally over! Support ‘account’ closed, license restored, back to a normal life! Dom is in college and all my assistance is ‘voluntary’, nothing forced by a Court. You can read a ‘sterilized’ settlement agreement here. This was reviewed by a couple of lawyers (including a Harvard Law grad who practices Family Law in NY), even though no attorneys appeared in Court. With “much” reluctance, it was accepted by the Court. A very important statement (at least in New York) is that you both understand your legal responsibility to support your child to age 21. Having the child concur with the arrangement is also important. This was the final order issued, it did the job, and cleared the support account. The only people that benefited from my denigration as a parent were in the legal system. If they had valued me as a parent, instead of just as a ‘cash machine’ — my son would have a lot more of both…. June, 2011 – Dom has graduated from High School! Had a nice party for him here and we were able to visit family & friends. Thought I could apply for a “restricted” work license this month, but DMV told me I hadn’t driven in so long I needed to apply for a new license — they then told me I can’t even apply because of the support suspension. I’m lucky I can do some internet work from home. April, 2010 – I suspended my most recent reform actions because I had to get back to work — but I can’t. DMV won’t let me drive (even with a restricted license) because I have a conviction for driving without a license. They tell me, “only Child Support can lift the suspension.” But as details below show, Family Court and my former spouse have no interest in lifting the suspension. At least I should be able to apply for a “restricted” license in June of 2011. March, 2010 – I’m lucky the original Court session didn’t last long. The costliest part of an Appeal can be getting the transcript — but in my case the whole appearance was about 5 minutes — just 7 pages. Click here for a copy. Refer to my earlier motion for copies of all documents referenced. February 25, 2010 – In a brief written decision, the Appellate court denies the entire request. It was very disappointing to get a basic ‘form letter.’ I will attempt to complete the appeal. January 18, 2010 – Having the suspended license is a real problem for basic living in a rural community. I make a motion to the Appellate Court for “poor person” status on the appeal and also to get my license restored. 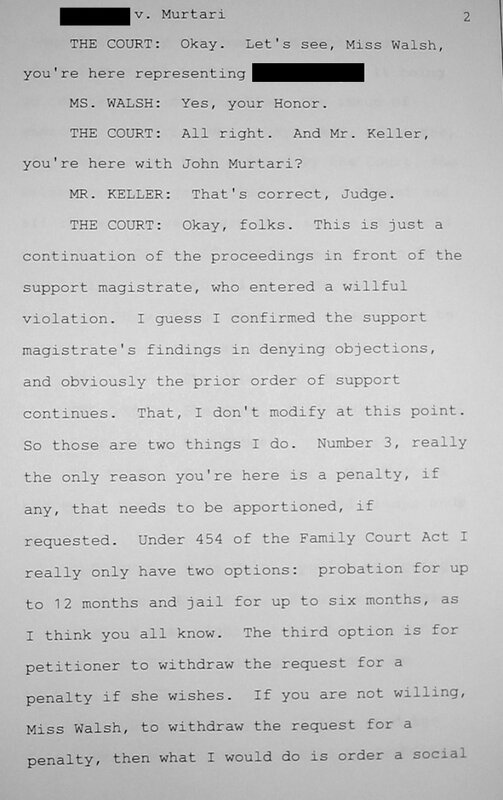 November 25, 2009 – I get what appears to be a “boiler plate” decision from Judge Sirkin rejecting my objections. I Notice an Appeal a few weeks later. November 21, 2009 – After waiting for months, I write another letter to Judge Sirkin and send a copy of that with a cover letter for reform to local Assemblyman Robert Oaks. October 27th, 2009 – I again call the Family Court clerk and ask about the status of my objections which were filed back in May. I’m told they will send a note to the Judge regarding status. 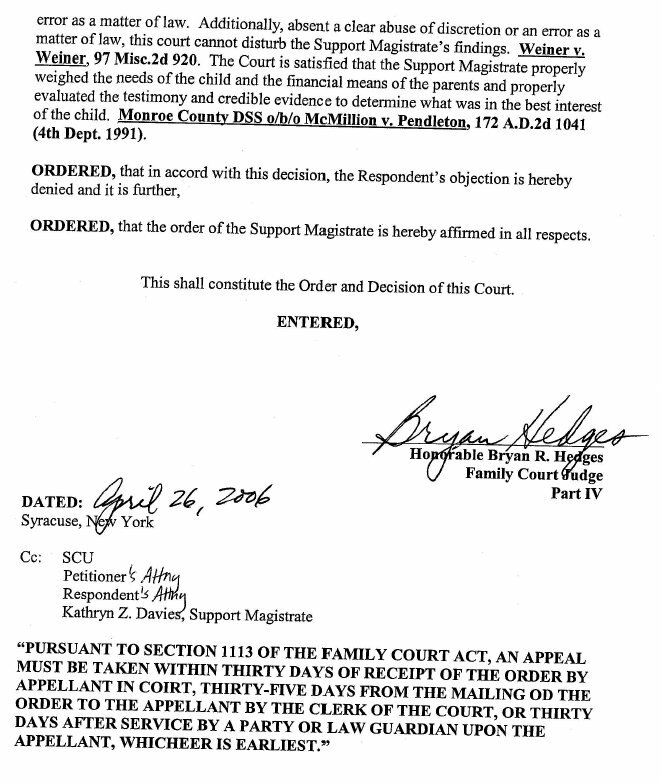 August/September 2009 – I call the Family Court clerk and ask about the status of my objections. They tell me the original Judge that had been assigned, Judge Kehoe, recused himself and that Judge Stephen Sirkin was assigned. In addition to the suspended license, I can’t renew my passport and have some very ill Aunts I would like to see before they die. I write a one page letter to the Judge asking for help. June 8, 2009 – A real shocker. I have to go into Lyons Village Court for sentencing (a fine) for an unlicensed operation ticket from last year (click here for full details, traffic_jm). I’m shocked when Assistant DA Richard Wunder asks that I be sent to jail immediately for the ‘maximum sentence’. Domenic was at home. I couldn’t believe what I was hearing and pleaded with the Judge — fortunately, I was just given a fine. I understood this was some type of ‘revenge’ from the DA’s office for my audacity in asking for a trial (even thought it was my right) on the matter which I asserted involved police misconduct. People sometimes ask me what ‘volunteer’ for jail by NonViolent Action — because it will happen anyway at a time the ‘system’ selects. A much more powerful statement of Faith and belief is made in voluntary action. June 5 – July 17, 2009 – Domenic is here for our six week summer vacation. We’re fortunate that at 16, he has a Colorado license and can drive. We have a great time raising chickens, flying model rockets, bike-riding, kite flying, and even working on the bathroom toilet! I don’t even think about the Family Court stuff. The web hosting business I have has become untenable. I can’t even get to my offices in a nearby town and decide to just close it down. Some of my customer have had web sites with me for over 10 years! I owe them a graceful transition — I plan to shut the business down and then commit to NonViolent Action in the fall regarding the “Right to Know you’re a Parent” outside the offices of local NY Assemblyman Robert Oaks. May 21, 2009 – I file my objections (kept it brief to two pages) and ask that a temporary order be issued restoring my ability to drive. May 4th, 2009 – Appeared in Wayne County Family Court. After months of preparation and expense, the whole support modification proceeding was over in less than 10 minutes. Support Magistrate Deborah Farber dismissed the action (page 2,3) for “failure to allege a change in circumstance since the last order.” It was hard to believe, she appeared rude & impatient with me and it looks like the whole thing had already been pre-judged — it was disappointing to not even get a chance to present the facts. The basis of her decision was an automatic Cost of Living Adjustment (COLA) that had gone into effect in 2007 — a pretty automatic thing in New York without even a court appearance. I reviewed the COLA and it specifically states it is not to be used as a time bar for modification requests. In NY the next step is to submit “Objections to an Order by a Support Magistrate”. The objections are reviewed by an actual Family Court Judge. In the past (below), that has pretty much been a rubber stamp — I hope for something different this time! 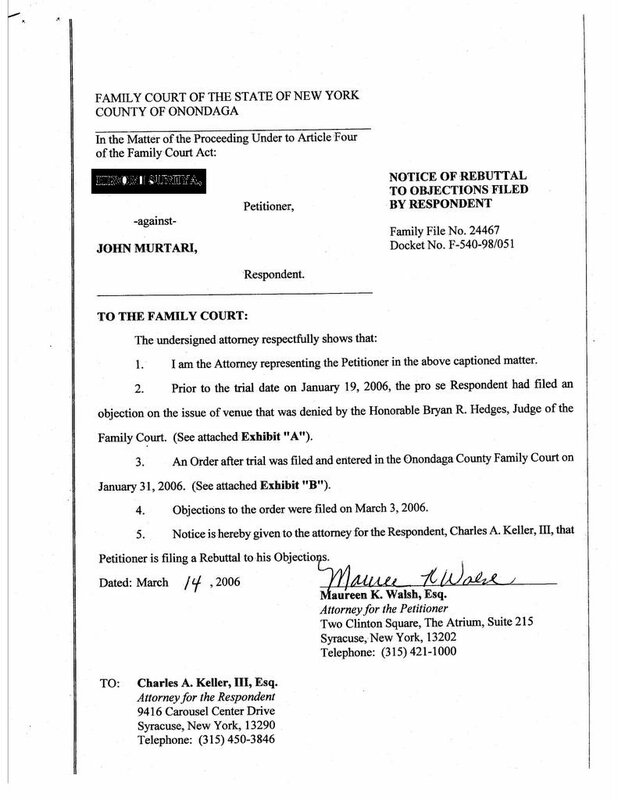 March 2009 – John finally completes a petition for a support modification to be heard in Wayne County Family Court. It has been a long time coming and he is hopeful a new set of eyes may result in a just outcome. After some recent arrests(traffic_jm) in his hometown John had to stop driving and has not done so since Nov of 2008. It is difficult on his business which is 40 miles away and he lives in a rural area. This is a real long shot. The arrears are huge (over $90,000) and I am just buried. For a while it seemed that Adrienne (my former spouse) and I might be close to reaching a real settlement. Pay X dollars and we call it even, get support collection out of our lives, and both move forward. The ‘X’ I could have paid was a long way from the $90,000 owed and it would have taken dramatic action on her part — of course, the root cause, a terrible system that ignores rights and allows these terrible situations to develop… Domenic is scheduled to come for six weeks on June 5th — I really hope to have that license restored, both for him and my work. If the Court says no it will be a very difficult situation. 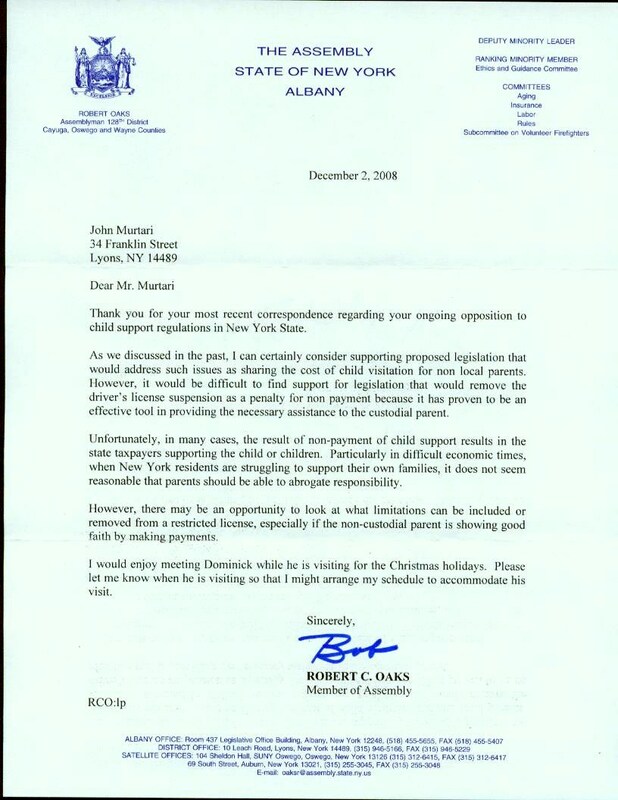 December 5, 2008 – John gets a letter from Assemblyman Robert Oaks, his representative in the State Legislature. He is told license suspensions are “effective” in collecting support. December 1, 2006 – John was set free at approximately 11 AM. John is very, very thankful for all your support – it was greatly appreciated! More details to follow. November 29, 2006 – John will be released on Friday, Dec. 1st. On Thursday his feeding tube will be removed in preparation for his release Friday morning. Click here for more. November 28, 2006 – John had a news interview with Syracuse Channel 3 (http://www.wstm.com), an NBC affiliate. The segment aired during their evening news hour. We are working on making clips of the video available. 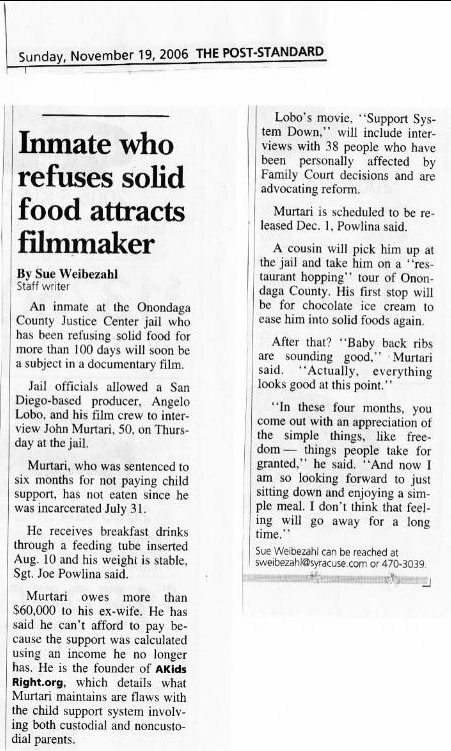 November 24, 2006 – Murtari is okay – release date is Dec. 1st. We sent out a request for help on Wednesday when John Murtari was notified his release date had been delayed from Dec. 1st to Dec. 6th. We wish to let everyone know that everything is okay and John should be released, as originally scheduled, on December 1st. John called in late on Friday and gave us the news.Click here for more. We are making some plans for a “rally” at the Syracuse Federal Building. There are Congressional offices there, most importantly that of Senator Hillary Clinton. Here are some planning issues we are struggling with and your thoughts, especially if you have planned or participated in a rally, are welcome. Click here for more. November 19, 2006 – Another update is published in the local Syracuse Post Standard Newspaper. Click here for a scanned image of the article. November 18, 2006 – Another TV news story containing an interview with John has been airing on our 24-Hour local news channel. See the story and video segment athttp://www.news10now.com/content/story_links/?SecID=345&ArID=86493. November 16, 2006 – John was interviewed by film producer Angelo Lobo for ‘Support? System Down,’ a full-length documentary. You can find trailers here: http://www.supportthemovie.com. Both John and Angelo report the interview went very well. Click here for more. November 8, 2006 – Today is John’s 100th day without solid food. “November 8th marked my 100th day without solid food as the tube feedings continue. The fast food commercials on TV are starting to look very, very good! Only 23 more days until freedom with dignity on December 1st. It’s still too early to say what we have accomplished here, but what’s next?” Click here for more. October 31, 2006 – A message from John — 30 more days in jail. Well, 30 more days of jail. All attempts at early release failed (more details in a later message). I will be released on December 1st and hope to make a weekend visit out West to see my son in early December and then have him with me for Christmas vacation. Until then I will continue my part of our effort and keep enjoying my tube feedings — they have saved a lot of wear & tear on my teeth. Maybe I will be able to become a spokesperson for Carnation Instant Breakfast: Surviving on 8 cans a day and feeling fine! Click here for more. October 24, 2006 – John’s request for early release today was denied. October 23, 2006 – Bargaining away your rights in Court? As many of you have experienced, negotiating in Family Court and agreeing to “compromise” can be like walking through a mine field — not to mention you often have to make life altering decisions with only a few minutes to decide. Click here for more. October 18, 2006 – John’s attorney, Mr. Charles Keller, appeared in front of Judge Hedges this morning asking for a reduced sentence. It seemed as though Hedges was leaning towards letting John go free, until the other attorney strongly objected. In the end, Hedges said he’s withholding his final judgement until October 24 at 9 am when everyone will meet again, including John. Hedges said, “I’d really like to see this negotiated.” He wants both sides to come to a settlement. Click here for more. October 13, 2006 – Praying for help in Family Law Reform? What about belief in God? What is the role of prayer in reform? An uncomfortable topic for a lot of people, including me. People contact me and say, “John, I like your messages and ideas, but can you get rid of the Faith & God stuff. A lot of people don’t believe and it’s a distraction.” What about prayer? Click here for more. October 11, 2006 – John’s court appearance for an immediate release is scheduled for next Wednesday, October 18th. His tube feedings continue and he’s in good condition. John certainly hopes to be set free and thanks all of you that wrote to the judge recently on his behalf. He looks forward to going home and seeing his son, but is also ready to continue his efforts until December 1st if he is not released early. 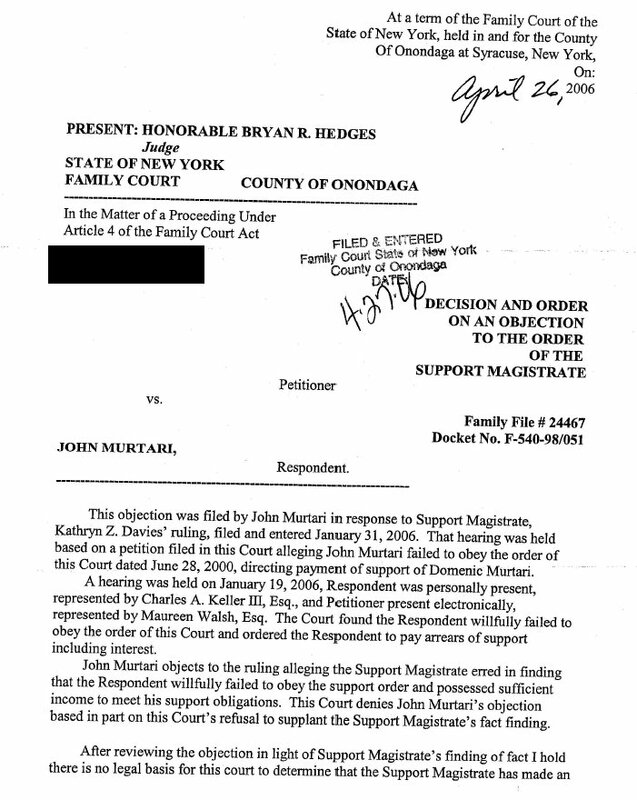 September 26, 2006 – After the denial of a stay at the Appellate level, John’s attorney will be filing a motion for sentence reduction with Judge Hedges. This is the judge that originally sentenced John to jail for six months. September 19, 2006 – Today is the 50th day John has gone without solid food. He is in stable condition and is being fed via nasal-gastric tube while imprisoned. 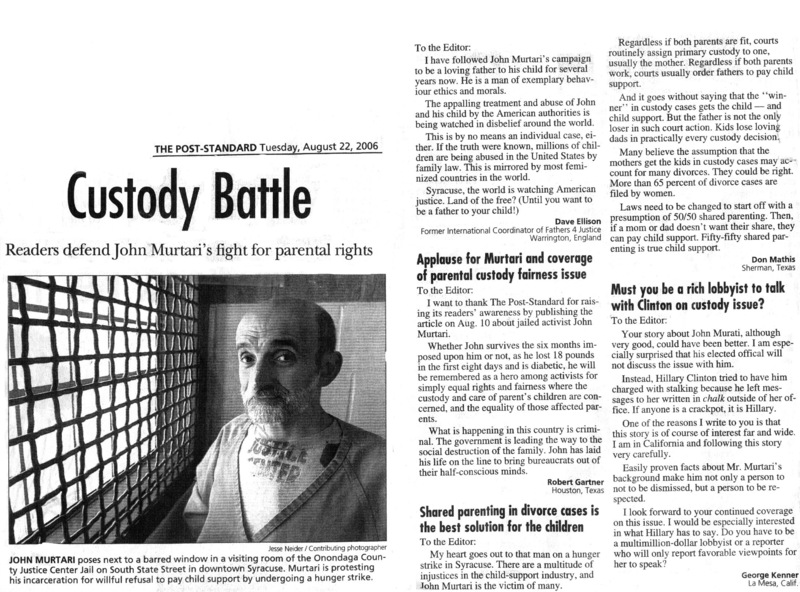 September 18, 2006 – John Murtari learned that a New York Appellate Judge had denied his request for “a stay” of his 6 month jail sentence. His attorney was frustrated by the decision. As many of us know it is difficult to win an appeal in Family Court cases due to the wide discretion given trial judges. It affirms the need for strong protection before a decision is made separating parents and children. There is still hope. John’s attorney will be preparing a motion to trial Judge Hedges to ask for a reduced sentence. This should be completed in the next week. September 10, 2006 – John was interviewed live from jail on the WGY Laurie Reilly Show (Albany, NY area). Check the Audio/Video Library for a link to the story. September 9, 2006 – Another update is published in the local Syracuse Post Standard Newspaper. Click here for a scanned image of the article. September 7, 2006 – Loving Sacrifice and Jail — Makes Sense? I’ve asked myself that more than a few times. Why jail instead of probation? Why a feeding tube and make it a more painful experience? Will it bring recognition of Family Rights any closer? Very serious and valid questions. Here are some thoughts and your FEEDBACK is welcome! August 30, 2006 – John received a new feeding tube today. Read a message from John (written on August 25th). August 28, 2006 – Read about A Day in Jail. This was written by John on August 20th. August 25, 2006 – John’s attorney, Mr. Charles Keller, visited him in jail today. He told John that Judge Hedges made it clear he would not allow John to appear in front of him again, that John’s only choices were to accept probation or do the time. Mr. Keller expects to appear in front of an Appellate Judge early next week. He’s going to ask for a stay which would get John out of jail. August 24, 2006 – A news story containing an interview with John has been airing on our 24-Hour local news channel. See the story and video segment athttp://www.news10now.com/content/story_links/?SecID=345&ArID=77342. August 23, 2006 – John is surprised when the doctors don’t reinsert the feeding tube today as originally planned. “They want me to feed myself, or at least drink on my own,” he said. “I didn’t; the only water I’ll have now will be to keep my mouth moist.” John’s health is expected to decline even more quickly this time since he’s not starting out in perfect health. August 22, 2006 – An article appears in the “Letters to the Editor” section of today’s local Post Standard Newspaper. Click here to see a scanned image of the article with photo. August 19, 2006 – A syndicated column is written about John. This article appears in 20 papers nationwide. August 17, 2006 – Group PR person Teri Stoddard talks about John on a Podcast. Click here to listen. August 15, 2006 – Read a message from John in jail. 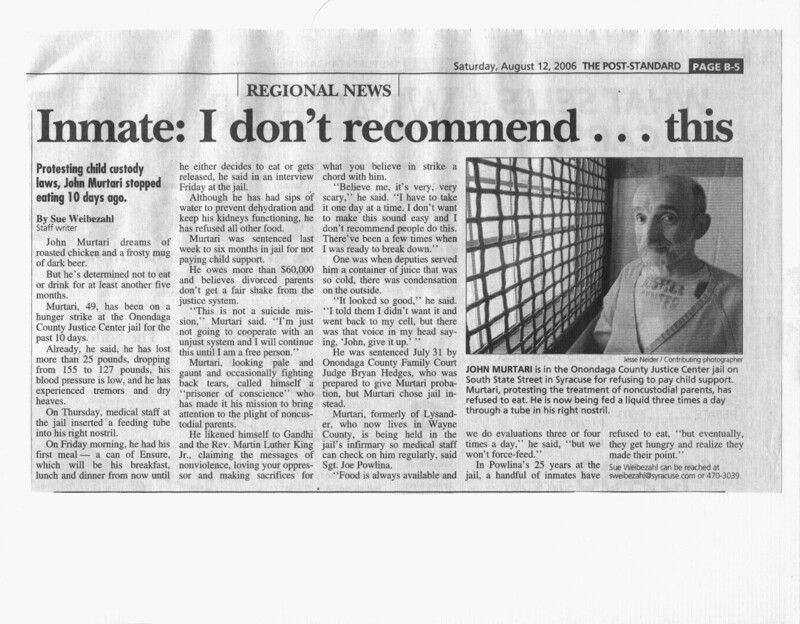 August 12, 2006 – Another newspaper article about John is published in the local Post Standard Newspaper (click here for a scanned image of the article with photo). August 10, 2006 – A newspaper article about John is published in the local Post Standard Newspaper (click here for a scanned image of the article) and another article was published in the Finger Lakes Times (regional paper). John also received a feeding tube today. August 9, 2006 – John was told he would be receiving a feeding tube tomorrow. His weight is down to 127 lbs, from 155. He’s lost twenty-eight pounds in 10 days. His blood pressure is so low he says they can’t get a diastolic reading. The doctor told him he should be healthier for the procedure, so he agreed to drink a little water and 2 cups of nutritional supplement. A rally in John’s honor was held at the Onondaga County Courthouse in Syracuse, NY. Click here for details. John wishes to thank everyone. Two demonstrators walked over to the jail to visit him but they were not allowed since it wasn’t his normal visitation day. John was taken to a local hospital emergency room Friday when his heartbeat became rapid and irregular. Plans to give him fluids by IV were halted for reasons unknown, and he was returned to the Onondaga County Justice Center medical unit. At the insistence of the Justice Center doctor he drank 3 small cups of water, the amount of fluids he was told he would have gotten from the IV. John hadn’t had any food or liquid since July 31, except for small amounts of water that get swallowed when he brushes his teeth. He was told he’d get a feeding tube Monday. On Monday a Senior Medical Administrator at the Justice Center told John they would not be putting in an IV or feeding tube, as he’d originally been told. She said there were ethical considerations involved. Fearing permanent kidney failure, the doctor again asked John to drink but he refused. She said if the condition progressed to an emergency situation they would take action and send him to an emergency room for treatment. Saying, “It’s not easy,” John had been praying for guidance. Tuesday morning John had uncontrollable shakes, and later was told since it is his choice to starve, medical personnel at the Justice Center will not intervene. Mr. Keller, John’s criminal attorney, is currently checking on their official stance, and will do what he can to bring a third-party doctor onto the case. When John learned of the planned rally in his honor, he celebrated by drinking 6 more ounces of water, which was good news to many people who fear for his health. He said he also did it because didn’t want to have “the shakes” if he was going to be interviewed. He asked that his sincere thanks are conveyed to everyone concerned about his situation. Offers of donations for press releases have exceeded our initial request, so with their permission we will use some of the money donated by generous friends to pay for John’s next set of paperwork to be filed with the courts. With luck, and a stay, he could get out of jail, at least for a few months. John loves reading your letters. Click here for his address. August 3, 2006 – John is moved to the Syracuse Justice Center. You are welcome to write to John. Click here for his address. Contact information for public officials & media — let them know you care! July 31, 2006 – John began his six month jail sentence today, at the Jamesville Correctional Facility near Syracuse. He reported to the Jail at 4 PM, and as planned, refused to cooperate with staff once he identified himself. He took a seat in the lobby. He refused to answer processing questions and politely explained that he was not going to cooperate. John stayed sitting in a chair until two officers placed him into custody and dragged him out of the room. If the Judge says, “Go to jail.” or I’m told my ability to see Dom is ‘suspended’ — I will just lay down on the floor and be polite, but passive. I will talk to them, but I won’t help in any way or answer any processing questions. Anywhere they want me, they can carry me (and probably drop me – ouch!). In my jail time I’ve seen how they handle uncooperative prisoners. They limit communication, use of the phone, and put you by yourself. It doesn’t bother jail officials that much, nor me. “Yes, I’m doing this because I should not be a prisoner. “Yes, I know this will make your job a burden. I’m sorry. I’ll tell you I am a bit anxious about what is going to happen. How far will I have to go? How much sacrifice will be required? Have I done all the preparation necessary to get ready … (read more). 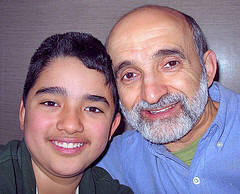 July 25, 2006 – I just finished six weeks of vacation (click for details) with my son Domenic yesterday. I was hopeful going into Court today. The probation officer confirmed where I lived and wrote a positive report about our home environment. He made a home visit while Dom was here. He also talked to Dom and stated in his report that Dom wanted to be here and that we had a good relationship — however, the bottom line was not paying, and he recommended a “short period of incarceration”. Instead of sending the case to Wayne County, the Judge was ready to sentence me and offered me twelve months of probation. The terms would have included me promising to comply with the support payments (which would have made it impossible to see Dom anyway), and also obeying all laws (which I am already violating by driving with a suspended license). It would have also inhibited my planned actions for Aug 15th at the Federal building regarding Senator Clinton. I will just lay down on the floor and be polite, but passive. I will talk to them, but I won’t help in any way or answer any processing questions. Anywhere they want me, they can carry me (and probably drop me – ouch!). In my jail time I’ve seen how they handle uncooperative prisoners. They limit communication, use of the phone, and put you by yourself. It doesn’t bother jail officials that much, nor me. Your HELP – we will soon have contact info posted here for local elected officials, Congressman James Walsh, Senator Hillary Clinton, and the US Attorneys and local DA offices. Please call and write them. The issue is our Civil Rights as parents to be able to nurture our own children — and certainly be free from the threat of jail as we follow good conscience. May 3, 2006 – There was a Court appearance at 10 AM, with Judge Bryan Hedges. Onondaga County Family Court. After the recusal by Judge Klim I fully expected to end up sentenced to jail. Judge Hedgese had already rejected our Objections to venue (below, May 2). What happened was a surprise. Many thanks to those who contributed to my legal defense! Many thanks to Mr. Keller, my attorney, he has been steadfast in pursuing that correct legal procedure be followed and giving me the best representation he can. 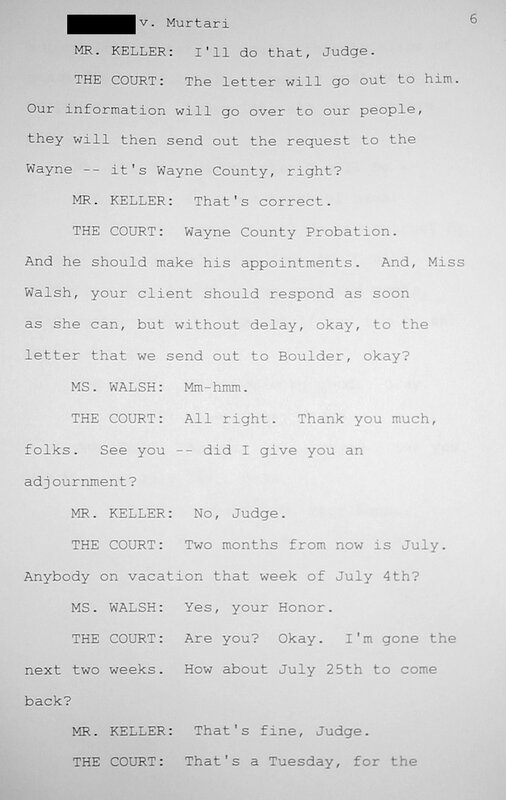 May 2, 2006 – I receive a decision from Judge Bryan Hedges (page 1, page 2), rejecting the objections made by Mr. Keller (my attorney) to the earlier decision. Most of it looked like boiler plate easily applicable to any case. The strongest argument made by Mr. Keller was regarding the improper venue and short cuts to ‘due process’ — that is not even mentioned. 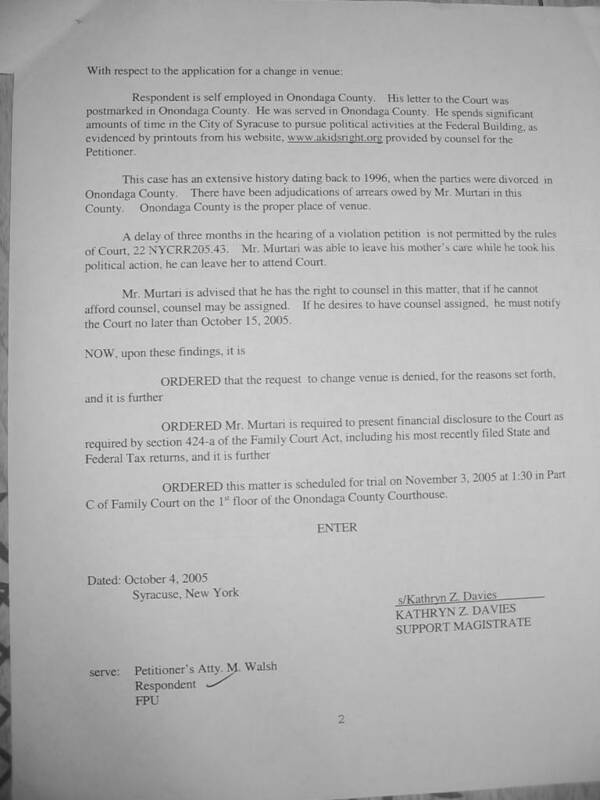 April 26, 2006 – Back on March 24 I had completed a Criminal Complaint regarding the other attorney, Ms. Maureen Walsh, regarding intentionally using the wrong address on an affidavit submitted by my former spouse in a successful attempt to establish the wrong venue (which I complained about earlier below – Sep 2005). Since then I had phone the investigator twice regarding my allegation and heard nothing in reply. Today I sent a letter to Mr. Bill Fitzpatrick, the Onondaga County DA, asking for a status update. April 22, 2006 – I am notified that a new Judge, Bryan Hedges, has been assigned. The trial date is set for May 3rd, at 10 AM. Judge Hedges is the same Judge that had ruled against the improper venue argument I made back in November, 2005 (below) and also made by my attorney recently. April 17, 2006 – My attorney writes a cover letter, and includes my letter to Judge David Klim, regarding his recusal. We ask him to clarify what offensive material might have been found at the web site. A few days later I do get a copy of the actual transcript of our brief appearance on Apr 10th: page 1, page 2, and page 3. Here is a brief excerpt of what was said, and what I found personally offensive given our emphasis on NonViolent Action and treating everyone (even those with whom we disagree), with dignity, respect & compassion. 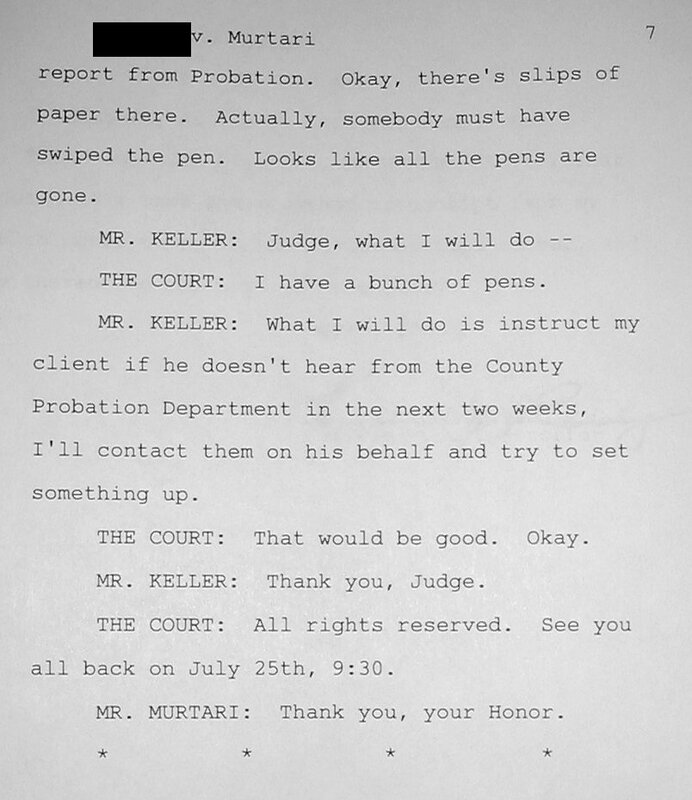 JUDGE KLIM: I’m going to recuse myself because I cannot be objective with Mr. Murtari. He has a web site which has numerous, negative things, about me on his web site. It’s been on for several years, and I — I don’t want to be overly — I don’t want to react to that, so I’m going to recuse myself based upon his web site and the numerous comments about me. 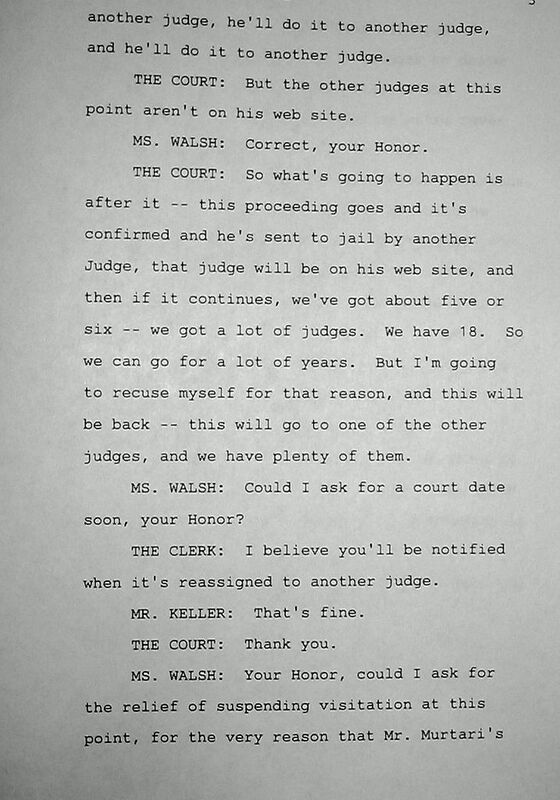 MS. WALSH: Your Honor, if I could be heard on that matter? It will just go to another Judge, and he’ll do it to another judge. JUDGE KLIM: But the other judges at this point aren’t on his web site. MS. WALSH: Correct, your Honor. JUDGE KLIM: So what’s going to happen is after it — this proceeding goes and it’s confirmed and he’s sent to jail by another Judge, that judge will be on his web site, and then if he continues, we’ve got about five or six — we got a lot of judges. We have 18. So we can go for a lot of years. But I’m going to recuse myself for that reason, and this will be back — this will go to one of the other judges, and we have plenty of them. 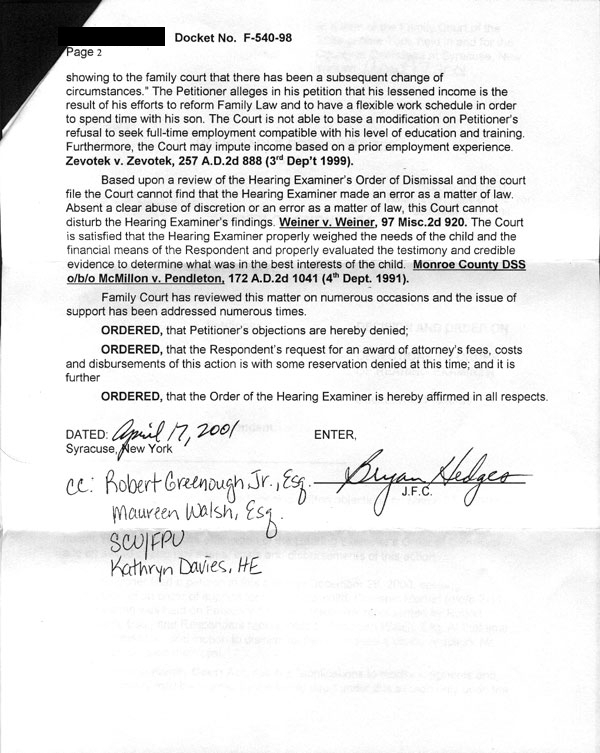 April 10, 2006 (update) – We appeared in front of Judge Klim and he immediately recused himself from the case stating that he was aware of the AKidsRight.Org (this) website and that on this page (in the prior history below from a 2000 trial) I had printed negative comments about him and criticized him. He said he couldn’t be fair. It was disappointing. We know have to wait for another Judge to be appointed. During my first trial there was a brief break and I had remained on the witness stand (near the Judge). He leaned over and told me, “Mr. Murtari, you see how bad the clocks are around here. If you want to fix the system, you should start with the clocks.” … read more …. April 10, 2006 – Scheduled court appearance at 2 PM, at the Ononondaga County Courthouse, Syracuse, NY. (click for directions). Judge Klim will hear the case, the same Judge that sentenced me to six months in jail several years ago (see details on that below). Your presence is welcome. If the Judge says, “Go to jail.” I will just lay down on the floor and be polite, but passive. I will talk to them, but I won’t help in any way or answer any processing questions. Anywhere they want me, they can carry me (and probably drop me – ouch!). In my jail time I’ve seen how they handle uncooperative prisoners. They limit communication, use of the phone, and put you by yourself. It doesn’t bother jail officials that much, nor me. March 24, 2006 – I completed a Criminal Complaint regarding the other attorney, Ms. Maureen Walsh, regarding intentionally using the wrong address on an affidavit submitted by my former spouse in a successful attempt to establish the wrong venue (which I complained about earlier below – Sep 2005). Feb 28, 2006 – My attorney, Mr. Keller, files objections to the order and makes a very strong argument regarding improper venue. The other attorney files a response: page 1, page 2, page 3. Jan 31, 2006 – The support Magistrate issues a decision finding me in willful disregard of the order and callous toward the needs of my son. Click here for a copy of the findings and the decision. The case is referred to Family Court Judge David Klim for an appearance on April 3rd. This same Judge sentenced me in 2000 to six months, details below on this page). The Magistrate recommends a six month jail sentence and also recommends I be referred to Federal Prosecution under the “Save Our Children” program. Jan 29, 2006 – My mom passes away at home. Jan 19, 2006 – I get a phone call at home to testify, my mother is ill in bed in the next room. Mr. Keller was unsuccessful in his motion on venue and we try to do the best we can with limited preparation. Jan 2006 – I am fortunate to have a very qualified attorney offer to represent me for a nominal fee. Mr. Charles Keller, a former SU Law faculty member and former chief of the Criminal Division at Hiscock Legal Aid. This is the attorney (assigned counsel) that was able to get over 30 different charges for numerous arrests dismissed in Syracuse City Court for my activity regarding Senator Clinton at the Federal Building. 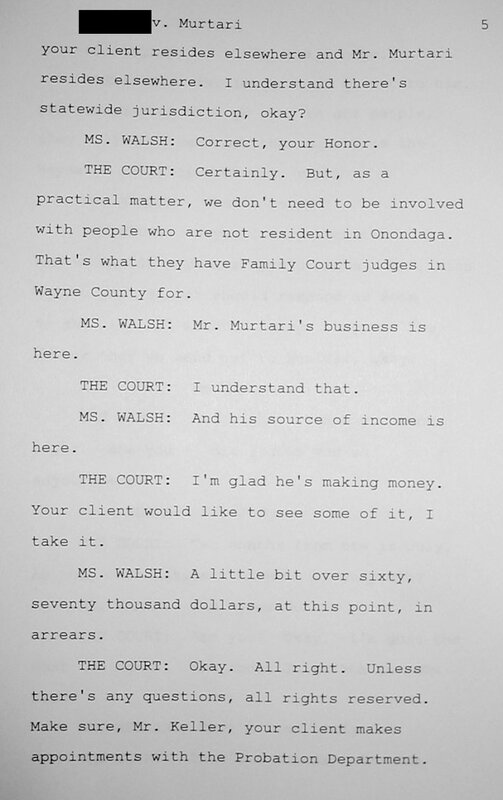 He has never practiced Family Law, but was very concerned about the issue of ‘venue’, agreeing with me that this case should not be tried in Onondaga County. Jan 13, 2006 – I send a brief letter to Judge Hedges (and the Support Magistrate), expressing my surprise and disappointment that my objections were ignored. My trial is suppose to be Feb 19th and I doubt I will be there, I complete a sworn affidavit and submit it to Support Magistrate Kathyrn Davies along with a brief cover letter. 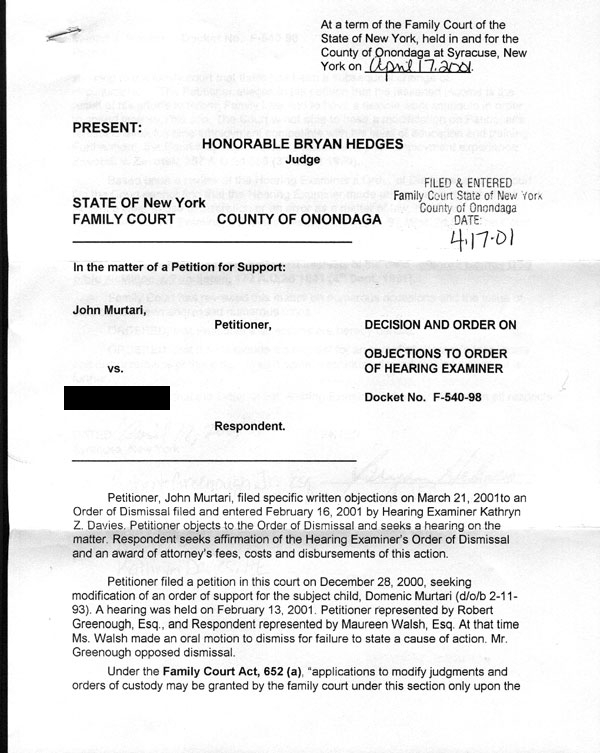 Dec 1, 2005 – I receive a letter from Judge Hedges stating that my objections, filed on Nov 5, were denied. A trial with a Support Magistrate is scheduled for Feb 19th. Nov 29, 2005 – The trial date of Dec 12th, conflicts with my trial for driving with a suspended license (traffic_jm). I send a letter asking asking for it to be rescheduled. Nov 5, 2005 – I submit objections to original order of Oct 4th. Oct 31, 2005 – Only a few days before the trial, I was still not sure if I would have assigned Counsel. 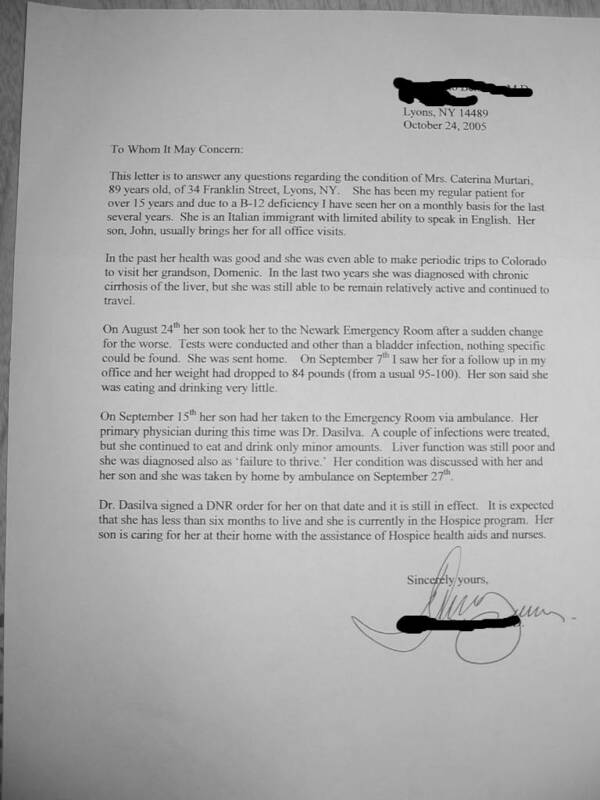 I write to the Court again and also document my Mom’s condition with a doctor’s letter. 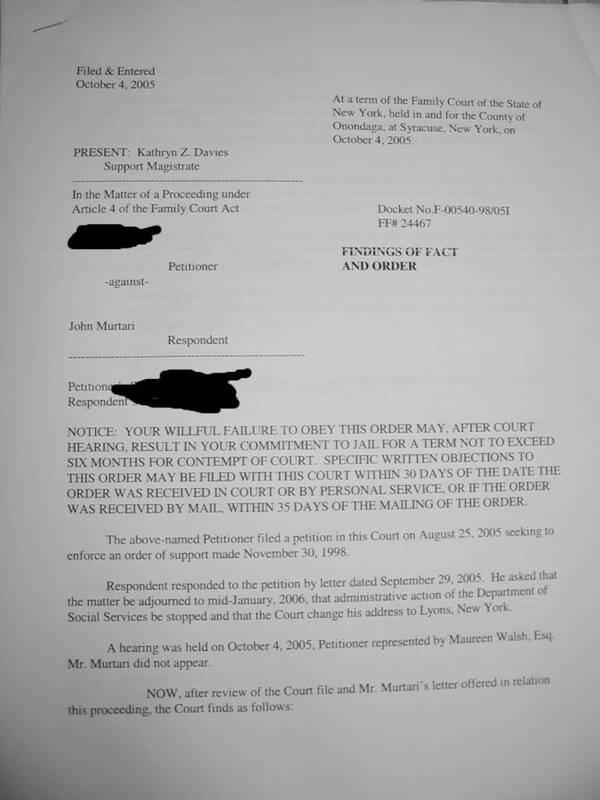 Oct 7, 2005 – I receive an order from the Court (page 1, page 2) denying my request for more time or change in venue. A Trial is scheduled for Nov. 3rd. I send in one reply requesting Counsel. I do get a transcript of the session where I was not present, click here. Sep 2005 – My mother is very ill and comes home from the hospital via ambulance. She is on the hospice program for the terminally ill. I get a show cause order from my former spouses attorney. I send in a reply challenging the venue and asking for more time. I will not appear on Oct 4th. June 7th, 2005 – John reports to the US Attorneys office in response to a deposition order of May 6th. The deposition is conducted by three people from the Department of Justice, Mr. William Pease, Chief Attorney of the Civil Division, Mr. Richard Southwick, US Attorney prosecuting John, and a paralegal that had reviewed the financial material. Their is also a Court reporter present to produce a transcript (cover page). It takes approximately two hours. No further action is taken, the analysis confirms no hidden resources and that financial statements were accurate. 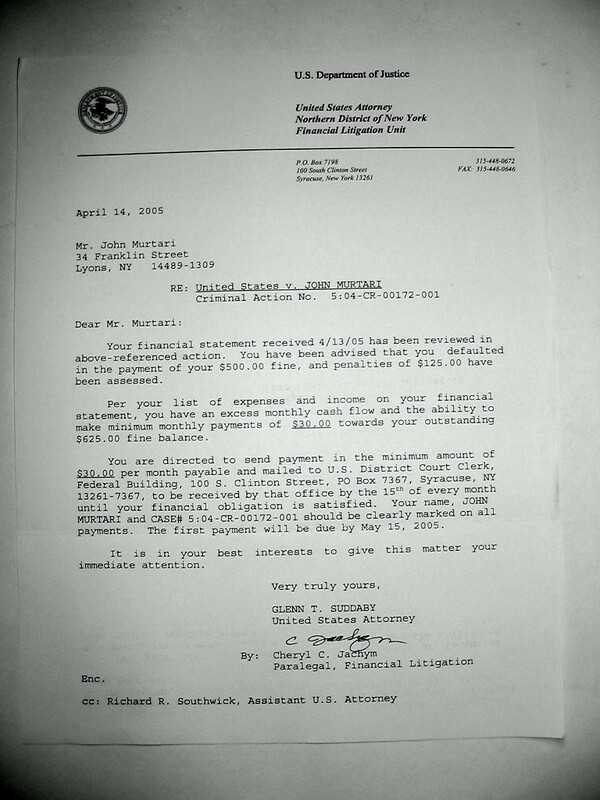 April, 2005 – John had an unpaid $500 fine to the Federal Government. Earlier in the Spring he had completed a financial statement for the US Attorney’s office. John completes summary worksheet of his family finances. A few days later he gets a letter saying the material was reviewed and he should be able to pay $30/month. Feb 2001 – On getting the written order, we appeal to the Judge. I do not have the actual objection, this document is a DRAFT I prepared for Bob, but it is essentially the same argument we made. As my December 28th release date approaches, I wanted to share some thoughts and feelings with you. In the coming weeks I will also be seeking your advice as our struggle for Civil Rights continues. I have to say how much I was moved by the story told by Lady Litton in our last list message of November 9th (http://www.AKidsRight.Org/archive/archive2000/). How she was willing to risk being a prisoner — all because she had been denied the right to vote. Something many of us now take for granted. Why don’t we see many parents involved in protests for reform? Perhaps because so many just don’t realize they deserve better. They just don’t know how badly their rights have been violated — that the right to nurture our own children is certainly one by which we have “been endowed by our creator,” in the words of the Declaration of Independence. * If Dom is involved in a serious accident and lies near death — no one has to notify me. * If there are different courses of treatment available and even though I have an excellent education — no one has to ask my opinion. How many of you are troubled by what you “might have done” in Court to make things different. How could you expect a reasonable outcome when so many of your basic rights were either not recognized or violated by the Family Law unique to your state. * Your right to a strong presumption of equal contact with your children (innocence). * Your right to the protection of a jury. * Your right to a speedy trial and to cross examine all witnesses. Criminals have all these rights, what about parents? It is time we get Federal Civil Rights legislation passed to recognize this in all states. See the Family Rights Act for full details: http://www.AKidsRight.Org/act.htm. My faith has deepened here; certainly God sees, God knows, and God cares — about Domenic, my former spouse, me, and yes, even the judges and lawyers. I know that by acting with LOVE, being willing to sacrifice, and continuing to pursue justice — I’m doing the most I can to bring all this to a happy ending. [Note: this does NOT mean everything these people do is okay, or that they shouldn’t be voted out of office, or even arrested or impeached. We are trying to separate their actions from their basic worth as a person. I have come to realize the importance of the NonViolent Action checklist (http://www.AKidsRight.Org/checklist.htm). I have been able to sacrifice six months of freedom not because I was angry, not because I wanted to prove a judge, my former spouse, or the system wrong — but because I was doing it out of LOVE for my child and my desire to give him two parents. This is something worth sacrificing for! SOME GOOD NEWS: After months of no contact, I was finally able to get my former spouse on the phone and make arrangements for me to travel to see Domenic for a weekend in January and February. I should also be able to bring him to my home for Spring Break, March 22-31. I’m just so happy to see my child again! MY SPECIAL THANKS to all those who made donations to ease the financial burden. See the list. You have helped make this Christmas Season special! COMING ATTRACTIONS: There will be more on this in our next message. I will probably be back at the Syracuse Federal Building in April, to carry a picture of my son and walk for our Civil Rights. I am hoping two mothers and two fathers will join me. It would send a very powerful message. I wish I could look and spy. I hope some day we can. did you ever get that toy? but tears when we say bye. not too many little guy. than green eggs and ham. could I love you in the dark? I will love you anywhere. I love you Dom, I love you. 10/24/2000 – John had written a letter to the Judge requesting that his “good time” be restored. He received a reply from his former spouse’s attorney. Judge Klim issues an order denying the request. It was a bitter disappointment. 9/12/2000 – John also received a letter from the federal district court which dismissed his Habeas Corpus petition for not “exhausting all state remedies first.” In addition, John wrote a letter to Judge Klim explaining his civil rights cause and request action for release. 8/14/2000 – While in jail, John was able to complete his Habeas Corpus Petition to the Federal District Court in Syracuse, New York. 8/9/2000 – John summarizes his experiences in jail on non-violent action. He wrote to the judge on August 2 and again to the judge on August 7, pleading for a temporary release. 8/1/2000 – John should have a Habeas Corpus petition ready for submission to the local U.S. District Court this week. He wrote again to Judge Klim on July 27th. 7/18/2000 – Thank you for your support and letters. John is still trying to get a delay in his sentence. 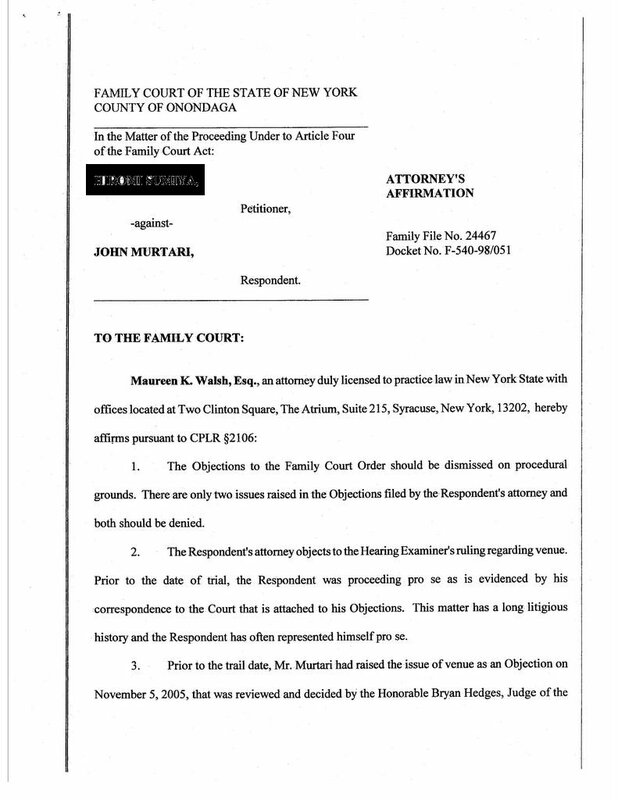 On July 13th wrote again to the judge and also to New York’s governor Pataki. He wrote again to the judge on July 20th. 7/5/2000 – John gets a letter stating he has no “cause of action” for a change in support amount. Even though his child had been relocated to California and he has high travel expenses. New York law supports his position for a change, but what can you do? 6/28/2000 – John has a brief trial and is sentenced to an immediate jail sentence. Today’s trial in front of Judge Klim lasted 90 minutes. After reviewing the case facts, John’s attorney asked the court for some understanding and leniency since John was to start his 6 weeks visitation with Domenic on July 12th. He asked the court to please hold off on a decision until after the visitation. Judge Klim then sentenced John Murtari to 6 months in jail at the Jamesville Correction Facility for violation of the order to pay child support. The past week has been hectic in Family Court. A trial starts today with another risk of jail over support issues. 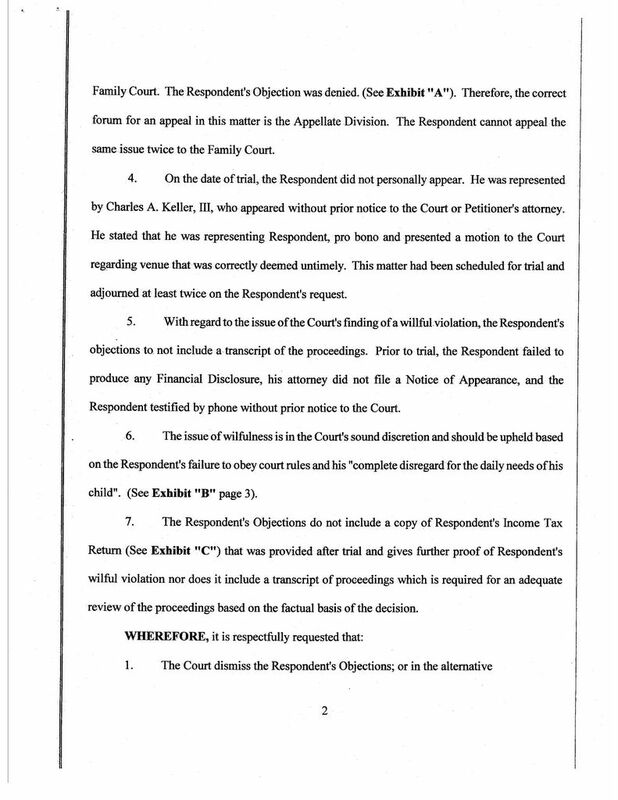 Yesterday, in an “amazing coincidence”, my petition regarding a custody violation is dismissed by Family Court Judge Hood for a real technicality (and then I find out she is Congressman Walsh’s sister!). 6/27/2000 – I am “ready” for trial? Fortunately I was able to contact a Mr. Bob Ravera, a long term acquaintance, was willing to represent me and wait for full payment. While lacking a bit in experience (he is a new attorney), he is a parent and is aware of my situation and past and agrees that there is an injustice here and things have become a “big mess.” My petition for modification & some notes I gave him. I welcome this chance to get these support issues resolved one way or the other. After spending a lot of money in supporting my son and doing everything I can for him and our relationship, it is strange to see the “system” treat me like a “bum”. I am very concerned, there is a real risk of jail today. As I told my attorney, “I would like to realize some compromise here, but the problem is I don’t have anything left…. they have taken my child, I’m living at home with my mother, and there are still $30,000 in judgements pending.” The most agonizing part is that I was due to start summer vacation with Domenic in just two more weeks, July 12-August 24 — even in the worst case I hope the Judge would delay jail till after that is over. 6/20/2000 – Got a letter from the Judge and was told he was removing the assignment to Mr. Bartholomae, but would not assign another counsel. Trial was scheduled for June 28th — no further adjournments. 6/15/2000 – I’ve had some real problems with an assigned counsel who just didn’t seem to have any time. Other real problems have also developed, an appearance was missed and a lot of time wasted. I have written to the Judge explaining what happened and asking for another attorney. The assigned Counsel was nice enough to write a letter to the Hearing Examiner. A few days later the attorney wrote to the Judge: page1, page2 and said he just found out from the Assigned Counsel office that I would not qualify for assignment. 6/9/2000 – Their was a big mix-up. My assigned counsel missed an appearance and my petition for a modification to support was dismissed. I had to submit a formal objection to try to get it back on the calenar. 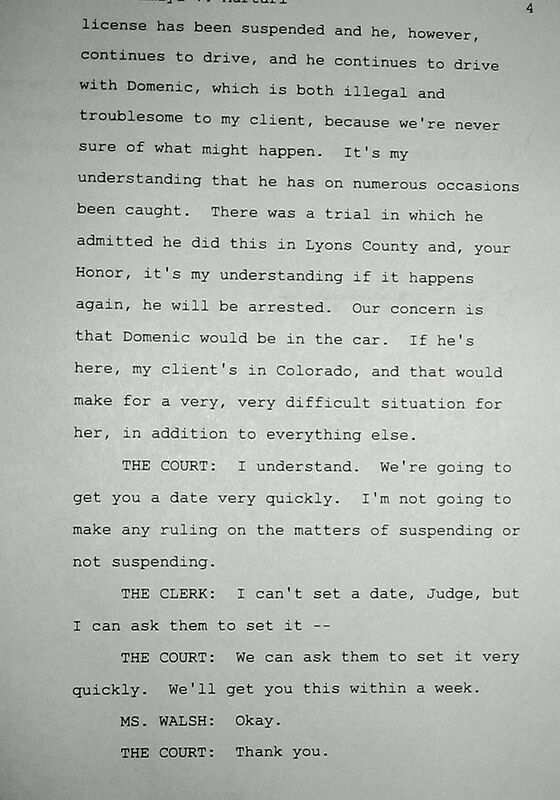 3/29/2000 – Appeared in Court, Judge Klim (a new Judge), was quite polite and handled the appearance without a “rush”. I was assigned counsel, and we will reappear on the 20th. 3/27/2000 – In the mail I got a signed order lifting the suspension (a great relief!). I also found out this is a pretty “standard” procedure when a modification request is pending (so it was not as difficult as I thought it was to temporarily lift). As this action proceeds I am going to try to get a realistic order — one that includes any travel expenses which are necessay for me to “support” Dom. Spring of 2000. The loss of my license was a real problem — It alone would stop me from seeing Domenic for 6 weeks this summer — not too mention the other problems! I realized that while it was not worth risking “jail” over just money — this had gotten to the point of basic self respect and the ability to fulfill family obligations. I prepared an order, and after having it filed (by coincidence), was served with court papers from my former spouse for “nonpayment”. With a Court date of March 29, I wrote a letter to the Judge explaining my request and included a copy of my pending request for modification. I also planned an NonViolent Action to not leave the Courtroom if my license suspension was not lifted. Spring of 1999. As part of another action, Domenic had been relocated to California. Collection of the support was turned over to New York State “Support Collection” services, they told me they could pull my driver’s license. It was a very difficult position now — If I wanted to see Domenic there would be no money left to pay — a bad situation. To Support Collection – Feb of 99 – Tried to explain to them there was no money according to their own guidelines, and the license should not be suspended. No reply. To the Trial Judge and Support Collection – April of 99 – Tried to explain again how limited the funds were and that I could not comply with order. Got a letter from the Judge’s office stating that no action was pending before the Court. To Support Collection – Sep of 1999 – Had gotten notice of a State Tax Warrant against me which could result in property seizure. Also applied to them for credit for travel expenses. They did call me a few weeks later to tell me the credit had been given, and was I aware my license had been suspended several months ago! To Commissioner of Social Services – Oct of 1999 – The license suspensions made this a crisis situation for me. I am an only child and have an elderly mother I care for. Got a three page response: page 1, page 2, and page 3. Probably the most frustrating thing is the feeling my letters are not even read. If you look at page 2 I am told I could have challenged the suspension, but my time has now expired — the whole point of my letter was to let him know I had challenged the suspension in a timely manner. Fall of 1998. I did make another attempt to petition for a change. It was again denied in a non-jury proceeding by a single “hearing examiner.” At the time I was supposed to pay $120/week (based on the $40K income) — I was actually paying $60/week (based on real income). It was denied and the appeal is very delayed. Withholding support has never been part of my protest actions. The focus has always been on equal physical and legal custody for parents. When Domenic was living here I was paying $60/week, at state guidelines based on my actual income. The problem was a support level set at $120/week based on “imputed” income. The Judge stated, “I should abandon my business (which was showing good growth), and take a regular job”. I was not willing to do that. The reason I was not willing to abandon my business was that I choose to start my own business to afford me flexible hours, flexible time for Dom. The Judge also commanded me to stop the volunteer work I was involved in at a homeless shelter so I could work more. Dom used to help me “make sandwiches for the poor people.” He saw how important it was by my actions, not words. Can you imagine a single person (the Judge) having that much power over your life? At that time I had Dom Thursday – Monday, every other weekend. He was four and the business gave me the flexibility to spend all these days with him — I never left him with a sitter. He had a “busy” schedule with Mom and came to enjoy & cherish our quieter time together. I still averaged more than 40 hr/week, working morning and evenings when Dom was asleep and weekends when he was not with me. I made a petition (see below) to the court system to modify the support level, but it was denied. I started falling behind. In 1999 Dom was relocated to California after my former wife gained permission through the court system. (A different Judge than the original). No adjustments were made to my support level so that I could see him. I saw myself cut off as a parent. I was never able to reach Dom on the phone (always got the answering machine) — Every week I leave a message on the answering machine, I write Dom once a week, send him gifts for the holidays — but I have received only one letter from him in almost 2 years. If I did not travel to see Dom, there would be NO contact. NO chance to provide hands on “parental” support. I made the conscientious decision to start my NonViolent Actions in 1999. My goal was to restore the relationship between Dom and me. My income dropped… I was getting farther behind on the court ordered child support payment, however I was spending more money on Dom. About $4000 in just travel expenses to see him for the summer and three other visits (all the way to California for just a weekend). I used my money to provide him direct “parental and emotional” support. Relocation was not an option. I am an only child and have an 84 year old mother who also needs my help. In practical terms my former spouse comes from a wealthy family and has the means to provide Dom’s “material” needs. Dom has never gone “without” the material things in life … if I did not choose to visit him, he would go “without” the emotional support I provided as his father. If I had ever felt Dom was in physical need, I would have abandoned my mother and moved out there. I have always been very honest with the Court about my intentions. I have offered the courts proof of how the money is spent — but it didn’t matter. (See my many letters below). Child support has become identified only with payments made to a support collection system and counted by computers. Why? Frankly, not because its a good measure of the money spent by a parent in providing material and emotional support to their child — but because it makes it very easy to collect and measure. Can a system of computers ever count love? If I could have spent the time with Dom and paid the money, I would have done it — but the system didn’t really care about that option. When the court system supported the relocation of Dom, they chose not to address the issue of “on-hands” emotional support for Dom from me. They left me with the very difficult decision … Do I provide Dom financial support OR Do I provide Dom with “hands-on” emotional support??? I knew this would be a “life-changing” decision. Your Donations – always welcome!